(Central Islip, N.Y., Aug. 14, 2016) – The three-time Atlantic League champion Long Island Ducks today announced that left-handed pitcher Eury De La Rosa’s contract has been purchased by the Houston Astros organization. 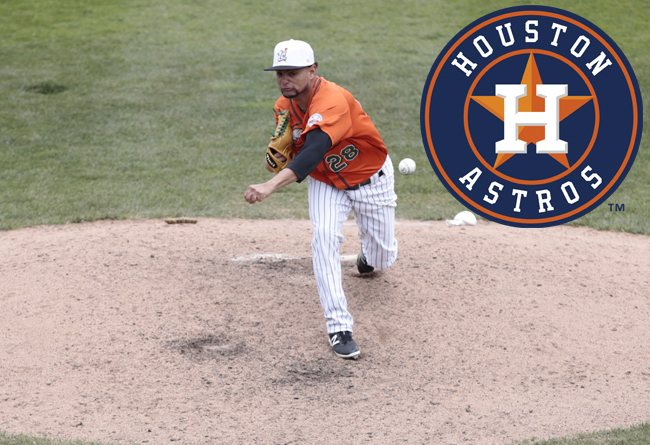 The first-year Duck will report to the team’s Triple-A affiliate in Fresno, Calif.
De La Rosa made 39 appearances (three starts) with the Ducks this season and compiled a 3-4 record and a 3.25 ERA. In 47 innings of work, the southpaw struck out 60 batters while allowing just 14 walks. His final three appearance were all starts, and he combined to yield six runs on 10 hits and three walks while striking out 14 in 13 innings of work. The 26-year-old’s best stretch came from April 23 to May 29 when he did not allow a single earned run in 15 consecutive outings. The Dominican native has two seasons of Major League experience with the Arizona Diamondbacks (2013-14). He went 2-1 with a 4.21 ERA and 48 strikeouts in 44 appearances at the game’s highest level. He spent the 2015 season with the Padres, Athletics and Dodgers organizations, reaching the Triple-A level with all three, and totaled a 4-2 record with a 3.32 ERA, eight saves and 54 strikeouts in 49 games (one start). De La Rosa was originally signed as an amateur free agent by the Diamondbacks in 2008. De La Rosa becomes the seventh Ducks player to have his contract purchased by a Major League or foreign organization in 2016. He joins pitchers Bruce Kern (Brother Elephants, Taiwan and Kansas City Royals), Darin Downs (Uni-President Lions, Taiwan), Jack Snodgrass (Texas Rangers) and Mark Blackmar (Washington Nationals), as well as infielders Nate Freiman (Boston Red Sox) and Mark Minicozzi (Vaqueros Laguana, Mexico).